Cities “crying wolf” may erode their messaging efficacy over time. “Carmageddon” refers to the horrific traffic jams predicted when a bridge reconstruction project in Los Angeles required closing 10 miles of the Interstate 405 freeway on two weekends. The closed freeway through the Sepulveda Pass between West Los Angeles and the San Fernando Valley is one of the most heavily traveled arteries in the world, with more than half a million vehicles passing through on a typical summer weekend. Traffic from the closures was predicted to back up for miles and spill onto local streets, severely congesting some parts of Los Angeles. Public officials tried to avert the expected traffic jams by warning drivers to stay away. Some of their messages appealed to civic pride and encouraged responsible voluntary cooperation. Others threatened nightmarish gridlock throughout the region. Media coverage was especially intense for the first closure, often gleefully focusing on a likely traffic disaster. 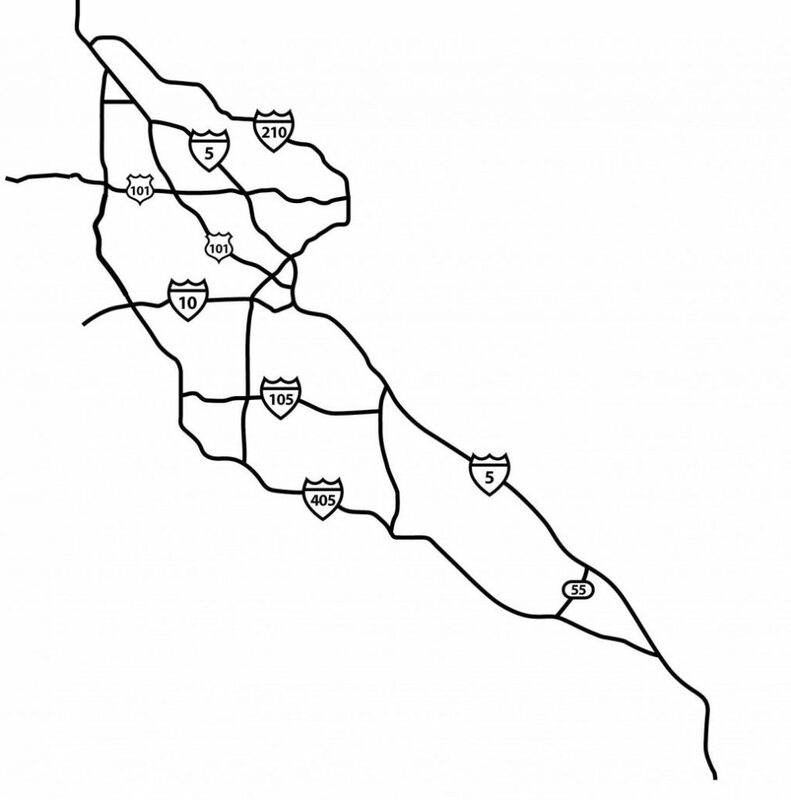 We studied how the roughly 300,000 travelers who traverse the affected stretch of the San Diego Freeway per typical summer weekend day responded to the two closures. To do so, we compared traffic volume and transit ridership from each of the closure weekends to baseline control dates before and after each event. Rather than creating chaos, the first closure greatly reduced traffic congestion. Most people chose to cancel trips rather than to reschedule them, but the reductions in travel diminished over the course of the weekend closure as people learned that congestion levels were far below the dire forecasts. 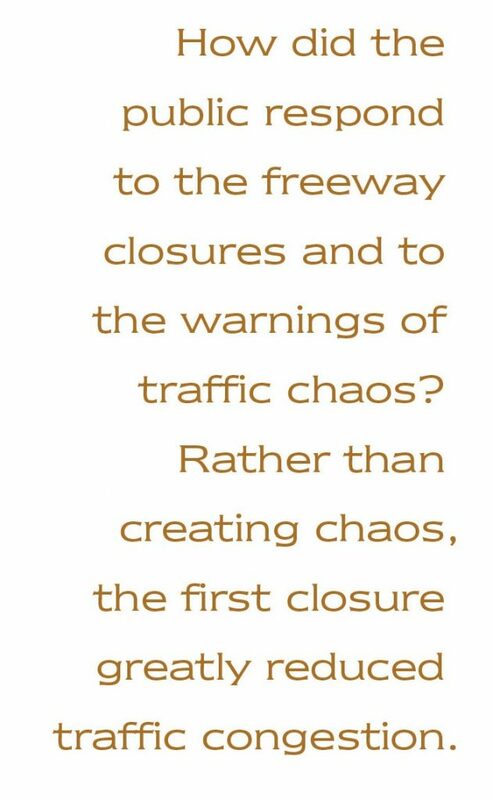 How did the public respond to the freeway closures and to the warnings of traffic chaos? Rather than creating chaos, the first closure greatly reduced traffic congestion. Most people chose to cancel trips rather than to reschedule them, but the reductions in travel diminished over the course of the weekend closure as people learned that congestion levels were far below the dire forecasts. 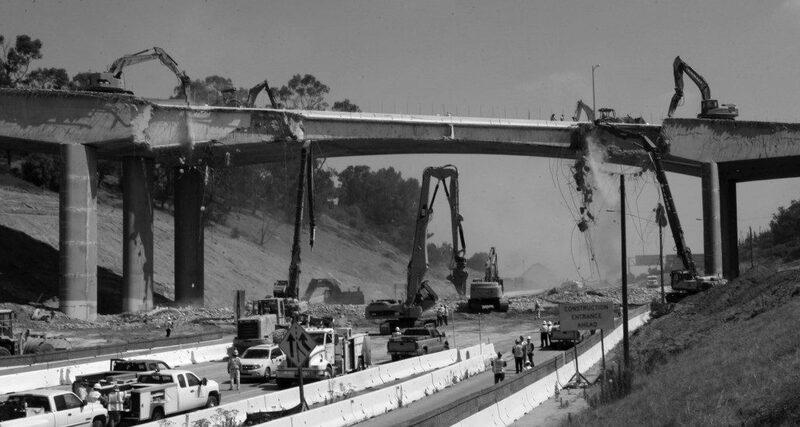 During the first freeway closure, contractors demolished the southern half of the Mulholland Drive Bridge over the 405 freeway. Reconstruction was followed by the second weekend closure a little over a year later for the demolition and subsequent reconstruction of the northern half of the bridge. 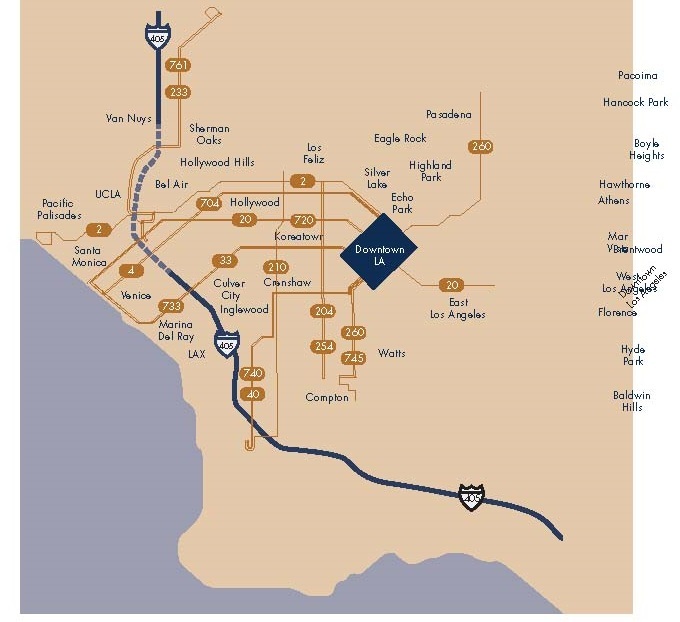 The Los Angeles County Metropolitan Transportation Authority (Metro), California Department of Transportation (Caltrans), and City of Los Angeles began planning well in advance to mitigate the effects of the closures. Plans included temporarily adding transit service and an aggressive outreach campaign, asking people to stay away, far away, from the closure. During the 2011 closure, Metrolink, the regional commuter rail authority, expanded commuter rail service and promoted a $10 weekend pass that allowed unlimited rides and free transfers to any bus or rail service in the region. Metro operated higher levels of service and free fares on its Red, Purple, and Orange Lines. It also increased service on closure-adjacent bus routes including one running parallel to the closure. To expand street capacity, the Los Angeles City Department of Transportation (LADOT) extended no-parking zones along major arterials near each closure. The California Highway Patrol used aircraft to monitor roadways so that crews could respond quickly to stalls and accidents. Caltrans established a state-of-the-art command center near downtown Los Angeles to monitor regional traffic conditions and to direct traffic management teams toward hotspots. 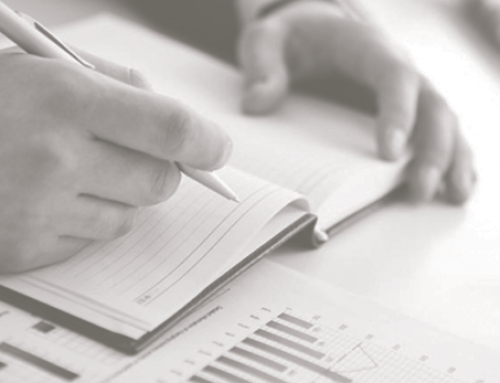 Officials delivered print, radio, online ads, and email blasts to over 6,000 organizations. Officials delivered print, radio, online ads, and email blasts to over 6,000 organizations. They configured electronic billboards to broadcast messages alerting highway drivers to the impending closure weeks in advance of the event. Metro used traditional websites, created Facebook pages for the events, and broadcast messages on Twitter, even leveraging celebrity star power for the first event, including Ashton Kutcher and Kim Kardashian. In the weeks leading up to the first closure, the media picked up and repeated news of the closure, often emphasizing the dramatic aspect of the story: monumental traffic jams were likely if motorists failed to heed officials’ warnings to avoid the area. Saturation coverage ensured that warnings of Carmageddon and its potential effects had reached nearly every driving age adult in Southern California by the time of the first closure. News headlines leading up to the event reported on how to “brace” for Carmageddon, “escape” from Carmageddon, how technology would “protect” Los Angeles from Carmageddon, how to “avoid” Carmageddon, and how to “arm” Angelenos against Carmageddon. While two distinct messages—one of hope and one of fear—went out, the messages of fear captured the media’s imagination. The dominant image that emerged from the chorus of local and national news reports and the huge volume of blogs, tweets, and Facebook messages was not a promise of adventure and opportunity, but of doom. News headlines leading up to the event reported on how to “brace” for Carmageddon, “escape” from Carmageddon, how technology would “protect” Los Angeles from Carmageddon, how to “avoid” Carmageddon, and how to “arm” Angelenos against Carmageddon. 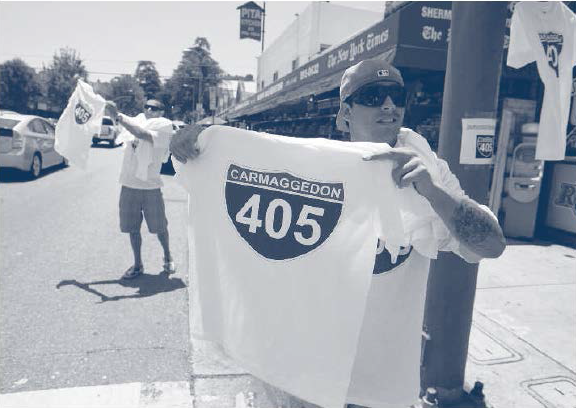 While transportation agencies broadcast messages similar in tone and scale for Carmageddon II the next year, the second event garnered more modest and measured media coverage locally, and almost none nationally or internationally. Taken together, the two closures provide valuable data on changes in short-term travel behavior in response to major planned traffic disruptions. Both closures began on Friday at 7 pm. Caltrans closed on-ramps, then connectors, and then shut down each lane. By midnight 10 miles of the I-405 in the northbound direction from the I-10 to the US-101, and 4 miles in the southbound direction from the US-101 to Getty Center Drive were closed to traffic. We obtained freeway traffic data from Caltrans, traffic volumes on arterial streets from the LADOT, and transit ridership data from Metro and Metrolink. We compared travel during the weekend closures against a baseline calculated as the average of four mid-summer, non-holiday weekend days in 2011, and four early-fall, non-holiday weekend days in 2012. This allowed estimation of what traffic volumes would likely have been had Carmageddon not occurred. Although the first closure was scheduled to run from Friday evening through early Monday morning, the work proceeded more quickly than expected, and the actual closure ended mid-day Sunday morning, about 15 hours early. The second closure ended an hour earlier than scheduled, early on Monday morning. Despite widespread media reports of impending disaster, traffic during the first freeway closure fell far below expectations, and even far below normal, on nearby freeways, adjacent surface streets, and even far-flung parts of the freeway network. Carmageddon II results were much more mixed; freeway volumes were down significantly from the baseline near the closure, but were up in some areas farther away. Adjacent surface street volumes relative to the baseline also rose significantly unlike the first closure. No evidence of preemptive or postponed trips: There were no substantial shifts in trip-making to weekends before or after the closures, or to days before or after the closures. No evidence of mode shifts: Travelers did not shift to public transit during either closure. In fact, they shifted away from transit use during Carmageddon I, despite increased service. Metro Route 761 parallels the closed segment of the I-405, and when compared to the baseline ridership fell by more than 20 percent during both Carmageddons, even though Metro substantially increased transit service during the first closure. Lower freeway traffic volumes near the closures: Travelers avoided driving near both closures. Traffic volumes on I-405 north and south of the closure were down by more than half during both Carmageddon I and II. On two intersecting freeways north (US-101) and south (I-10) of the closures, traffic was also down substantially. Lower surface street traffic during first closure and higher during the second: People stayed off closure-adjacent streets during the first closure, but shifted from freeways to nearby streets during the second. During Carmageddon I, nearby surface street volumes rose on a few arterials near the freeway closureexits, but fell on many others, suggesting that drivers did not shift in large numbers from freeways to surface streets. In contrast, during Carmageddon II, nearby surface street volumes rose substantially and consistently, suggesting that at least some of the observed drop in freeway traffic shifted onto arterial streets. 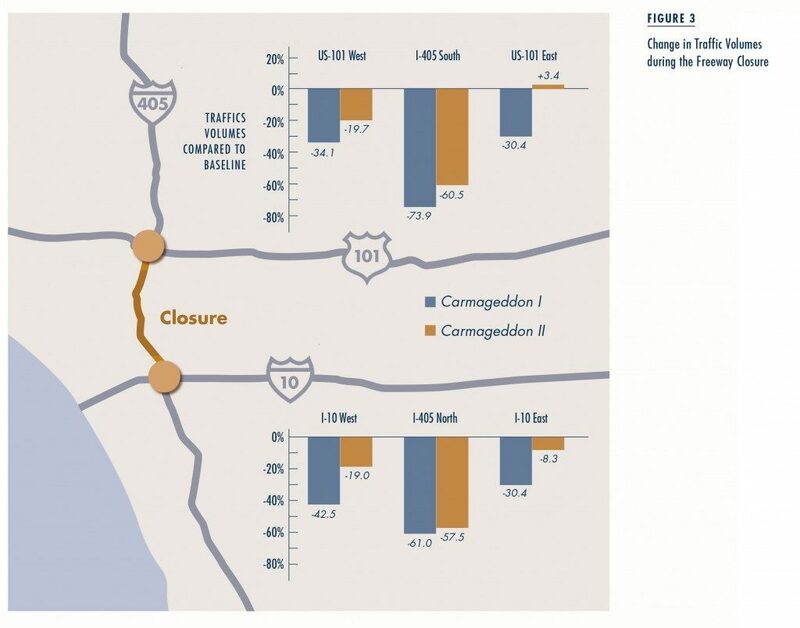 Carmageddons affected traffic levels far from the closure: For Carmageddon I, there were statistically significant declines in traffic volumes across Southern California freeways, suggesting either that few drivers chose to detour around the closure, or that those who did were outnumbered by those who chose not to travel at all. For Carmageddon II, traffic rose slightly on several possible detours around the closure. People quickly learned and responded: As the two weekend closures progressed, travelers responded to initially low levels of congestion by driving more. Changes in travel behavior eroded over time and across events: Northbound traffic fell on routes leading to and away from the closure on the Saturdays of both Carmageddon I and II. The statistically significant reductions in traffic declined with distance, extending more than 50 miles from the first closure. On Sunday of the second closure, we observed virtually no deviations from the baseline, regardless of distance from the closure. This is remarkable because the Sepulveda Pass remained closed until early Monday morning. The breathtaking drops in traffic volumes observed on the Saturday of the first Carmageddon had eroded so much by the Saturday of the second Carmageddon that traffic volumes had returned to normal on the freeway that was still partially closed. The preparations for and responses to two similar closures of a major transportation artery provide an opportunity to analyze both travel behavior and messaging strategies. 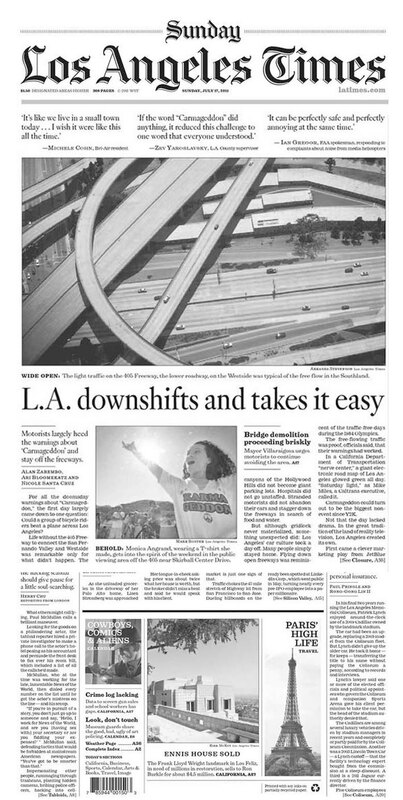 Weekend travel is more discretionary than weekday travel, and residents of Los Angeles responded rationally to the flood of information before the first closure. Some people likely changed their travel plans to include different modes, routes, or times. Many more, however, either stayed at home or chose to visit destinations closer to home. It is also clear that travelers absorb information quickly and respond accordingly. During the initial period of Carmageddon I, a large majority of motorists heeded the often dire warnings and stayed off the roads, most likely because: (1) the event took place during the weekend when a larger proportion of trips are discretionary compared to weekdays, and (2) the disruption was relatively short-lived—less than a weekend. As the event progressed and predictions of Carmageddon failed to materialize, motorists adjusted their behavior in response to more sober media reports and real-time traffic information. Some who had originally planned to avoid driving out of fear of nightmarish congestion likely reverted to their more typical driving behavior by taking highway or arterial detours. Comparing data from the two events provides evidence that travelers learn quickly from information and experience. The dramatic traffic reductions associated with Carmageddon I were not repeated during Carmageddon II. The media messages crying wolf prior to the first closure were tempered in the second, and travelers learned from the first closure that, despite some inconvenience, they could still drive to most destinations. The contrast between the perceived threat and reality was so stark that it left the media scratching their heads. During the second weekend closure, transportation officials and elected leaders again appealed for public cooperation, but tempered the messaging. There were many fewer predictions of chaos and more calls for the sort of civic responsibility that had made the first closure a stay-at-home, holiday-like event. The public responded by adjusting travel plans but foregoing far fewer trips than they had during the first closure. Despite fears that the public might ignore pleas to limit travel during the second closure because they were jaded by the lack of traffic chaos the first time, it appears that travelers used the information they were provided to respond appropriately. Transportation planners can learn much from the two Carmageddons. 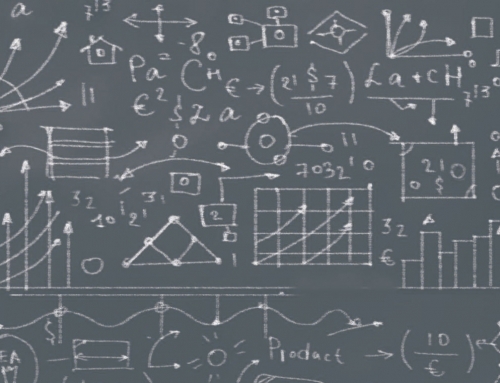 It’s helpful to carefully plan traffic flow patterns by scheduling closures on days when volumes are lower and trips are likely to be discretionary. But disseminating information can also be enormously effective—even more effective than providing alternative travel modes. As real-time information becomes more available to travelers, that information can complement system capacity to reduce cost and delay. Finally, crying wolf presents a dilemma and should be employed judiciously. Going overboard to scare people off of the roads ensures that the promised chaos will fail to materialize, but encourages the traveling public to take future dire warnings with a grain of salt. We are grateful to UCLA Graduate Student Researchers Anne Brown, Timothy Black, Earl Kaing, and Zodin del Rosario who analyzed the data presented in this paper under the direction of the authors. This research was conducted with support from the Los Angeles County Metropolitan Transportation Authority (Metro) and the City of Los Angeles Mayor’s Office. The authors express appreciation for guidance and support provided by Deputy Mayor Borja Leon and staff assistant Nat Gale. Zodin del Rosario, Earl Kaing, Brian D. Taylor, and Martin Wachs. 2012. “Why it Wasn’t Carmageddon: An Analysis of the Summer 2011 Closure of the Interstate 405 Freeway in Los Angeles,” Report to the Mayor’s Office, City of Los Angeles. Genevieve Giuliano and Jaqueline Golob. 1998. 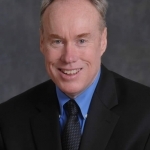 “Impacts of the Northridge Earthquake on Transit and Highway Use,” Journal of Transportation and Statistics, 1:1–20. 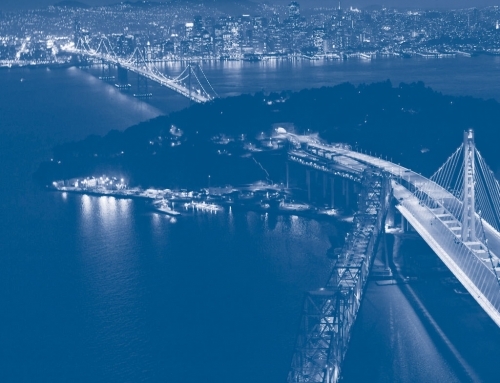 Reconstruction Projects,” Journal of Transportation Engineering, 116: 64–80. 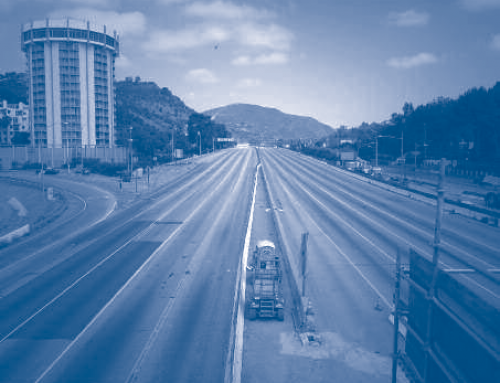 Public Awareness Programs for the US 101 Highway Reconstruction Project in San Luis Obispo, California,” TDM Review, 13: 10–13. Chester Wilmot and Matthieu de Lapparent. 2009. “Capturing Travel Behavior During Exceptional Events: Synthesis of a Workshop,” Transport Survey Methods: Keeping Up with a Changing World, First UK Emerald Group Publishing Limited: 213–218. Linda Wilson. 2011. 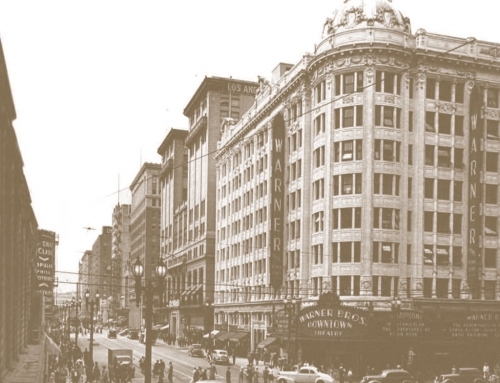 “From ‘Carmageddon’ to Complete Success,” Public Roads, 74(5): 20–27.